Rainbow Six: Siege is free to play on all platforms this weekend. Already live, the PC version will remain free through 5th February at 9pm UK time, while the Xbox One trial will last until 6th February at 7.59am UK time, and the PS4 trial will remain live through 6th February at 6pm. The free weekend offers access to all maps, modes, and Operators available in the full game. All progress made during this trial will carry over into the full version, should you choose to buy it. Rainbow Six Siege’s first year is coming to an end, but Ubisoft has already promised to support the game for a second year. Rainbow Six Siege is an interesting case. It suffered a somewhat muted launch last year, but positive word of mouth and good work on the part of developers have impressed players, to the point where more are now playing than when it came out in December 2015. So word of a second year of support is good news for Rainbow Six’s 10 million-strong community. What it entails, we don’t know, but new maps and operators look like a safe bet. The Division’s second big expansion, Survival, sees players take to a new blizzard-filled environment. The enemies are tougher, the environment is harsher, but you must persevere for the sake of a possible cure for the game’s pandemic. Details are thin on the ground, but it will be coming soon – and first to Xbox One and PC, as is the norm. Before that, The Division’s Underground expansion arrives later this month. It also includes Ghost Recon Wildlands, Splinter Cell and Rainbow Six Siege outfits for your character to download via Ubisoft Club. Ubisoft has issued a warning to Rainbow Six Siege cheaters and hackers: you’ll suffer a permanent ban on first offense. 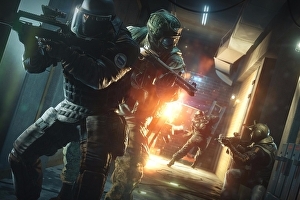 Rainbow Six Siege, a multiplayer shooter, came out in December 2015, and has run up against a cheaters and hackers problem, particularly on PC where wallhacks and aimhacks are popular. 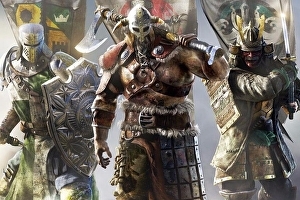 Now, Ubisoft has updated its code of conduct for the game, introducing a permanent ban on first offense for cheating and hacking. Rainbow Six: Siege can now be purchased on PC at a discounted price via a new that eschews many of the game’s features. 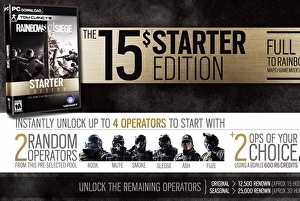 For a mere £12 / €15 / $15, players can purchase this Starter Edition that offers an initial two Operators (randomly chosen from Rook, Sledge, Ash, Fuze, Mute, and Smoke) along with 600 R6 Credits that can be used to unlock another two Operators (or other unlocks, should you wish). Unlocking further Operators works a bit differently in this budget priced Starter Edition. 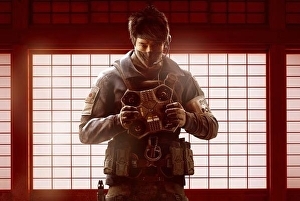 Each Operator will be unlocked after earning 12,500 renown. 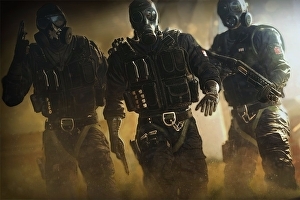 Comparatively, in the full-priced Standard Edition Operators are unlocked with only 500-2000 renown.